The race for San Diego mayor headed into its final weekend today with Kevin Faulconer picking up support from the leaders of seven local cities and a group of black officers breaking with the San Diego Police Officers Association to endorse his opponent, David Alvarez. Faulconer’s backing came from Chula Vista Mayor Cheryl Cox, Sam Abed of Escondido, Matt Hall of Carlsbad, Jim Desmond of San Marcos, Don Higginson of Poway, Judy Ritter of Vista and Bill Wells of El Cajon. Kevin Faulconer campaigns in San Diego. Faulconer, the senior member of the City Council, has been touting his experience over Alvarez, who is serving his first term on the panel. Meanwhile, the San Diego Black Police Officers Association announced that it is endorsing Alvarez, even though the SDPOA is supporting Faulconer. Alvarez said diversity in hiring and promotion will be critical to rebuilding the San Diego Police Department, which has been losing officers to law enforcement agencies in neighboring cities. Also, around half of SDPD sworn personnel will become eligible for retirement within four years. Both candidates have put forth plans to rebuild the department’s ranks. Tuesday’s election will determine who fills the nearly three years remaining in the term of Bob Filner, who resigned in disgrace Aug. 30. Faulconer and Alvarez won the most votes in a Nov. 19 special election, but neither received the more than 50 percent needed for an outright victory. Both candidates plan to attend campaign events throughout the weekend like holding rallies and walking precincts. 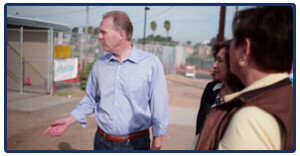 Alvarez will kick off a precinct walk at 9 a.m. tomorrow at Parkside Community Park in Paradise Hills, 6240 Parkside Ave. Faulconer will hold a Get Out the Vote rally at 10 a.m. at his campaign headquarters, 5215 Lovelock St. They have campaign events scheduled for Sunday, too. Results of a poll conducted on behalf of 10News and UT San Diego are expected to be released Sunday. Faulconer has generally led by a small margin in previous surveys, and political observers expect a close election that will be determined by Tuesday’s turnout. The county Registrar of Voters Office said it projects a turnout of around 45-50 percent of registered voters. Of the nearly 356,000 mail ballots issued, more than 159,000 were returned by early today. Another 993 ballots were cast at the registrar’s office, through Thursday.